Kriváň mount, which reaches 2495 metres, has also been a major symbol in Slovak ethnic and national activism. A country-wide vote in 2005 selected it to be one of the images on Slovakia's euro coins. You can check location of this mount here . It's said that every Slovak has to climb Kriváň at least once in his lifetime. Located in Horný Smokovec , part of Vysoké Tatry town. This option is great if you want some comfortable luxury. It's a beautiful place offers spacious apartments with mountain view. Close to hiking trails. There's no restaurant in this place. Located in Batizovce village . This place is a budget option, but we liked it. Room was nice and clean. Toilets and bathrooms are shared, but they were also clean. Actually, it looked like the rooms and bathrooms were newly refurbished. Big advantage of this place is restaurant on the ground floor - breakfast costs only 5 EUR, but it's ample and tasty. Both those places are great starting point for mountain hiking, as they're located in Poprad District at the foot of Slovak High Tatras. Kriváň is part of High Tatra mountains and, because of its significant height, it may be a bit too much for hikers who have just started their adventure with mountains. It's great option if you want to go level up and quit the valleys. We got up very early at Friday morning. It was still dark by then - we started our day at 3.30 AM to avoid heat and crowds on the trail. Kriváň is a very popular tourist destination and, in addition, it was August 15 th - Assumption of Mary which is a bank holiday in many European countries. We decided to "attack" the mount from the west, going along green trail which starts at Tri studničky (Three Springs) on 1140 metres, near the main road no 537. We chose that one because there's definitely much less people than on the red trail leading from Štrbské Pleso. The views were fantastic - the sun was slowly rising over the morning fog which was forming a white dense carpet as we were climbing up. We were so happy about that - we took a much needed break to take some photos (the trail was rather steep). The atmospheric conditions were so specific at that time that one of our friends saw a phenomenon called The Brocken Spectre . It's actually your own shadow, cast on mists below you, when you are mountain climbing. The shadow may appear enormous and has a ring around it. While climbing up, we saw a group of chamois and a very fat marmot . Mountain animals are 10 times better to admire than those in the zoos. We passed by a place called Grúnik - a memorial which witnessed some bitter fighting between the partizans and the Nazi troops at the end of the Second World War. There's a reconstructed bunker but, unfortunately, we didn't see it from the trail (were we too sleepy?). In Tatra mountains the levels of vegetation are very distinct. It's called altitudinal zonation, but I just prefer to call it layers of vegetation. 😉 What's worth to mention is that Tatra mountains , especially High Tatras, are of alpine characteristics. Weather can change in the blink of an eye, so it's necessary to take additional windproof and waterproof clothing. In general, our ascent was very long but enjoyable hike , the air was cool and humid. Only when we got closer to the peak it was getting hot and we could see in the distance big groups of people approaching the summit. At the final phase of our walk the trail got very rocky - it was stone run, a bit tricky to hike at some points. We were climbing rather slowly as the ascent was quite demanding - I'd definitely not recommend it for inexperienced hikers. 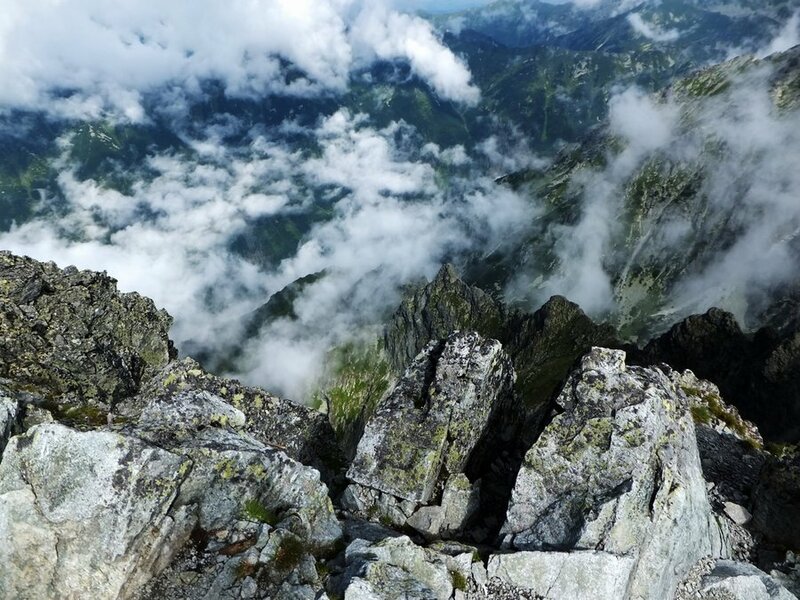 On the summit there was, fortunately, only a few people and we could enjoy breathtaking view of High Tatras in peace. We had a quick snack and decided to climb down as the sun already started burning our skin. On our way back we met many people and were really happy that we managed to wake up so early and had a chance to contemplate the magic of Tatra mountains in peace. However, after about an hour or two, our happiness got replaced with tiredness and pain. My knees and feet were hurting a lot and all I was thinking of was getting back to car. I must admit that it was demanding trip , no nice and easy few-hour-long walk in low mountains. Next day, we wanted to go for shorter walk as our knees were still aching after long climbing down from Kriváň. We decided to visit symbolic cemetery in Popradské Pleso (Poprad Pond) located on 1525 metres. This symbolic cemetery was built as a memorial dedicated to people who worked and tragically died in High Tatras. We left our car on parking right next to Štrbské Pleso lake . This name's used both for the large glacial mountain lake and very popular tourist resort. All parking lots near the lake are paid - the higher the parking is located, the more expensive it gets. We bought 2-hour tickets for Tatranská elektrická železnica - mountain tram which runs at the foot of High Tatra mountains in Slovakia. The tram station is located right next to the parking lot at the entrance to Štrbské Pleso. You can check the tram's timetable here . We traveled to the point where trail to Popradské Pleso starts - it's just one stop down from Štrbské Pleso. At first the trail is just an asphalt road, but a bit higher close to the forest it changes into proper dirt trail. Popradské Pleso lake is an awe-inspiring place - I do recommend to hike there. In general the walk wasn't very demanding - the trail is pleasant, nice and wide. It's great option for families with children (or tired hikers 😉 ). OK, there's one more thing besides Tatra mountains that Slovakia is famous for - waterparks! When you're in Slovakia, you need to visit at least one of those amazing aquaparks . On the last day of our trip we decided to go to Gino Paradise - thermal park in Bešeňová . You can check the location here . It was fun - there are many water slides, indoor and outdoor pools with hot mineral water, jacuzzis, restaurants, etc. The most interesting area's adrenaline zone - there's climbing wall from which you can jump into pool with high waves. How about you, have you ever climbed any 'national' mountain?